Nearly 40 people and 20 well behaved dogs gathered at Turntable Park in Sanbornville on September 1stfor the 7thAnnual ARFF Walk. The Animals Raising Funds for Food or ARFF Walk benefits the Wakefield Food Pantry (WFP) and, beginning in 2017, the Lakes Regions Humane Society (LRHS). Graciously escorted by the Wakefield Police, the brief ARFF Walk went right down Meadow St and concluded at the Poor People’s Pub. The ARFF Walk 2018 makes front page news! The ARFF Walk isn’t just for dogs - some years have drawn chickens, mini-horses and pigs. The successful event, featured on the front page of the Carroll County Independent(9-6-18), is also near and dear to St John the Baptist (StJB, www.stjohntb.org) Episcopal Church in Sanbornville, NH. In fact, StJB’s wonderful music staff since 2003 -- pianist Linda Loucony, and organist, Judy Gray – created the ARFF Walk in 2012 and served as chairwomen for its first three years. Linda and Judy, and many others in St John’s, have actively participated in all seven ARFF walks. “Judy designed the ARFF logo that is still in use,” shared Loucony, “Our Irish Wolfhound, Lupey, was the original ARFF dog and after she crossed the Rainbow Bridge, the Food Pantry honored her as the Founding ARFF dog in the 2015 walk.” “In the seven years the (ARFF) Walk has been held, we have raised over $25,000 for the food pantry,” detailed Judy Gray. 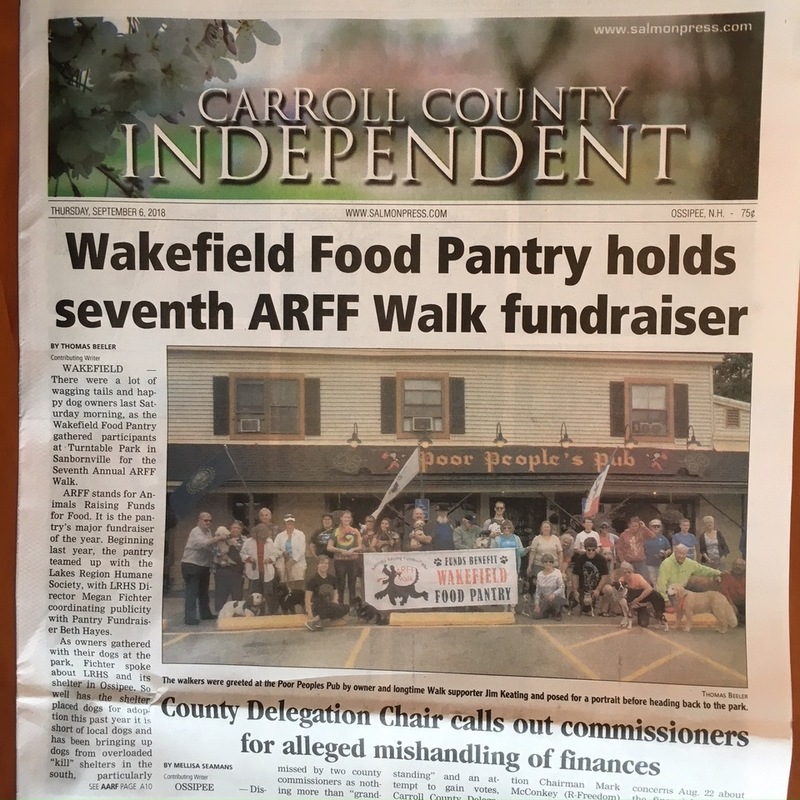 As the event grew, the Wakefield Food Pantry took over as ARFF’s primary leadership, although Loucony, Gray and StJB remain among its most stalwart stewards. For the past three years, WFP Director, Beth Hayes, has chaired ARFF, while WFP VP, Janet Bye, is poised to take the reigns next year. The Wakefield Food Pantry, run entirely by volunteers, serves the villages of Wakefield as well as Brookfield, Milton, Effingham and Newfield, ME with a singular mission – “hunger-free communities.” Located at 1500 Wakefield Rd, Wakefield, NH, WFP is open every Wednesday from 10 am to 1 pm and 5-7 pm. For more information, visit its new web site, www.wakefieldnhfoodpantry.com, or call 603-522-3094. ARFF Walk prizes were awarded to the dog who came the farthest, the smallest pet, and the dog with the youngest handler. “One couple walked with a baby that was 6 weeks old,” Loucony recalled, “they had two dogs and one of them had all the diaper equipment in his backpack.” Linda and Judy’s beautiful Irish Wolfhound, Oberon, was awarded a ribbon for the tallest dog on this year’s walk. In addition to monetary donations, many people brought in pet food and other supplies for the Humane Society. As owners and dogs awaited the ARFF start, Sarah Frohock of Sarah's Courteous Canine offered many interesting training tips. Megan Fichter, LRHS Director, also spoke about LRHS’ “no-kill” shelter in Ossipee and its influx of dogs coming up from the south. Visit www.lrhs.netor call 603-539-1077 for more information on the Lakes Region Humane Society. September 1, 2018 at turntable park ~ ~ RAIN or SHine! 10 am at Turntable Park - Bring your pets for some pre-walk fun! Free training tips from Sarah’s Courteous Canine. Gather and Sign in! Meet other dogs, pets and their people. Donations will be received for the Humane Society:Pedigree chopped chicken canned dog food, Friskees chicken pate canned cat food, Dawn dish soap, copy paper, laundry detergent. 11 am ARFF Walk -Turntable Park to Poor People's Pub and back! Come and serve our community!